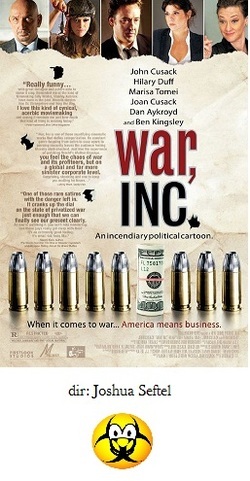 War, Inc. is such a congealed attempt at political satire that it borders on the unwatchable. John Cusack, who also co-wrote this turkey, is usually so dependable, but not this time. Cusack stars as an assassin for hire who is hired by the Vice President, played by Dan Aykroyd, to eliminate the oil minister of the fictional Middle Eastern country of Turaqistan (ha ha). As a supreme example of the moronic level of humor here, this oil minister's name is Omar Sharif, so the movie considers it high comedy to have characters continually utter lines about "killing Omar Sharif." Anyway, Cusack must go undercover as a war-mongering corporate entity that is putting together a trade show in that country. Aside from Aykroyd, Joan Cusack appears as a very ill-tempered assistant to John Cusack, Marisa Tomei is a liberal, muckraking journalist, Ben Kingsley is a villainous viceroy, and pop-star Hilary Duff plays an oversexed Turaqistani pop-star named Yonica Babyyeah who likes to put live scorpions down the front of her pants. I'd like to say more, but to be honest, after two attempted viewings of this ghastly wreck, it's still very unclear what the heck was going on. There is a lot of screaming, a lot of running around, a lot of gunplay, a lot of bad music, a lot of rockets, and a lot of vapid frenzied action that makes no sense. Oh, and no laughs whatsoever. Needless to say, the entirety of War, Inc. has all of the narrative flow of a bowel obstruction. When your movie's big thumb-nosing moment against corporate greed involves the accidental bombing of a Popeye's restaurant, you've got some major problems. War, Inc. wants to be this generation's Dr. Strangelove, unfortunately it's more like this generation's Deal of the Century, William Friedkin's misbegotten war satire from 1983. The lesson here is, if your film can't quite reach the level of a bad Chevy Chase movie, you might as well just give it up and spare us all.